One of the world's greatest directors, Carl-Theodor Dreyer has long been hailed for such masterpieces as The Passion of Joan of Arc, Vampyr, Day of Wrath and Ordet. Now we meet a different Dreyer who engages with broad humor, then gradually guides to a wise, bittersweet resolution. Aspiring parson Sofren is engaged to Mari, but her father won't allow them to marry until Sofren gets a ministry. He's hired by a small rural congregation only to discover that according to local custom, the widow of the deceased pastor may marry his successor. An aged woman who has already buried three earlier husbands, Dame Margarete asserts her right in order to keep her home, but Sofren also brings Mari to the parish claiming that she is his sister. The two plan to wait for the elderly woman to die. When it appears she might be eternal, Sofren begins a series of silly pranks to hasten the old lady's end, but before her death her wisdom, dignity and selflessness teach the young couple a great deal about fundamental humanity. Called "the first real Dreyer film," The Parson's Widow (aka The Witch Woman) prefigures key themes in his later work. Beautifully photographed in the 17th-century museum village of Lillehammer, Norway, the film's original luminous quality is captured in this digitally mastered edition from a 35mm camera-negative print. Plus two rare Dreyer shorts! They Caught the Ferry (1948, 12 mins.) adapts the technique of Dreyer's horror/fantasy Vampyr to a chilling and unforgettable miniature on driver safety. Thorvaldsen (1949, 11 mins.) uses the long lenses and confrontational style of The Passion of Joan of Arc to illuminate the search for truth in the work of the greatest Danish sculptor, which turns out to have a surprising affinity with Dreyer's own cinema. All three films digitally mastered from 35mm archive prints. 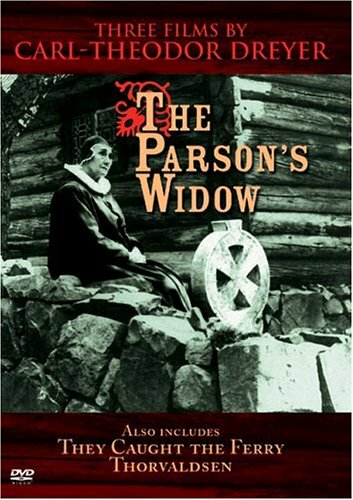 The Parson's Widow is speed-corrected and tinted, with new music compiled by Neal Kurz from the works of Edvard Grieg. If you have any questions about this product by DREYER,CARL THEODOR, contact us by completing and submitting the form below. If you are looking for a specif part number, please include it with your message.